Do you need a weatherproof camera? How important is it to have a weather-sealed body for your camera? Often considered as a trivial side feature by many people, having a weather-sealed camera can be very crucial under some conditions and circumstances. A weather-sealed camera does not only mean that the camera can endure being used under some rain or getting splashed. The term weather-sealed also means that the camera is supposedly able to endure any weather condition, either a very dry day with dusty wind or a monsoon season with extreme humidity. Dust and humidity can be as seriously damaging as rain and liquid – if your camera is not weather-sealed. Therefore, if you are living in a place with such condition, or if you are traveling with your camera to an extreme environment for photo hunting, using a weather-sealed camera is a must. Now, if we are talking about mirrorless cameras, which is the best weatherproof mirrorless camera that we can get from the market? 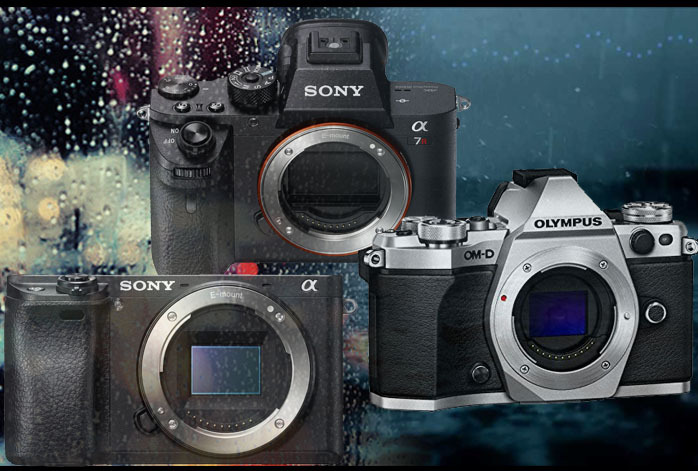 Below, we have gathered the top 3 weatherproof mirrorless cameras that you can rely on for capturing the most strikingly breath-taking storms and landscapes. Honestly, Sony a7R II is one of the best mirrorless cameras that you can get from the market right now. It features the world’s first 42.4MP full-frame back-illuminated Exmor R CMOS sensor. With such powerful sensor, Sony a7R II is one mirrorless camera that can easily rival even the best DSLRs on the market. The super-high resolution of the camera allows it to deliver large-sized images with extreme details and clarity and very low noise. Furthermore, Sony a7R II is armed with a 399-point Hybrid AF system that is very fast, smart, and reliable. It can quickly focus on the objects in the view, and track movements with superb precision. Combined with an excellent maximum shutter speed of 1/8000s, Sony a7R II can effortlessly freeze every precise moment and capture the time. You don’t even have to worry about minor blurs due to the nature of the hands or any other physical disturbance because Sony a7R II is armed with a powerful five-axis image stabilization system, which is able to compensate even the most ridiculous vibration ever. On the other hand, if you are into low-light photography, the ISO range that spans from 50 to 102,400 is certainly able to support your every need and requirement. Being able to shoot visible images in extreme darkness levels is one cool thing about Sony a7R II. In addition, it is capable of 4K movie recording with full pixel readout and no pixel binning. Packed with various features, Sony a7R II is not only about power and performance, but also about convenience of usage. The 2.4-million dot XGA OLED Tru-Finder is protected by ZEISS T* coating, and it has built-in WiFi and NFC for easy file sharing and remote control via the mobile app. There are also enhancement features such as shutter vibration suppression, silent shutter, and first curtain shutter. And, of course, it is weatherproof. It is able to endure some splashes and dust. However, it is not fully water-resistant, so it shouldn’t be submerged or get extremely watery. Olympus OM-D E-M5 Mark II is one weatherproof mirrorless camera that especially excels in still shots. The video recording quality is actually also very good, but, if you are seeking some 4K, then it is not a viable choice. Nevertheless, its capability in taking photos is astonishing. It is powered by a 16MP Live MOS sensor and TruePic VII image processor. The combination is very powerful that it has a 40MP High-Resolution Shot Mode. Yes, it is able to capture pictures with such extreme resolution. Making large-sized images with superior details and sharpness is not a big deal. Its power is furtherly enhanced by a powerful five-axis voice coil motor image stabilization system, making it able to erase any blur caused by any shake and vibration in any possible direction. The performance of the AF system is especially impressive, for it is able to focus on moving objects very fast and consistently track them. Olympus OM-D E-M5 Mark II actually has excellent video specs. It can record in 1080/60p with focus peaking, and there are also clean HDMI output and an external mic jack for capturing high-quality audio. However, it doesn’t support 4K movie recording yet. It is 40% smaller and lighter than traditional DSLRs, and is weather-sealed for splash-proof, dust-proof, and freeze-proof protection. Check the best deal for Olympus OM-D E-M5 Mark II here! Now, this is the jack-of-all-trades of mirrorless cameras. Sports photography? Check! Low-light photography? Check! HDR and Landscapes? Check! 4K video recording? Yes! Armed with a 24.2MP APS-C Exmor CMOS sensor with accelerated readout, and supported even further by the world’s fastest AF system with 425 phase-detect points, Sony Alpha a6300 can effortlessly capture pictures with superior details, accuracy, and precision. It is very viable for sports photography and snapping pictures of fast moving objects, especially considering the 11-fps maximum continuous shooting speed. It has an ISO range of 100 – 51,200, and a maximum shutter speed of 1/4000s. The colors and dynamic range are excellent. Unfortunately, though, Sony Alpha a6300 does not have any built-in image stabilization system. Thus, perhaps, it is best for more trained hands, or with a tripod for ensuring its stability. If you often use your mirrorless camera for video recording, too, Sony Alpha a6300 offers UHD 4K/30p maximum video quality. Or, it can record in Full HD 1080p at up to 120 fps. Of course, it features a weather-sealed magnesium alloy body. It is built with dust and moisture resistance, making it viable for photo hunting in a dessert, a tropical forest, or any other natural environment. Sony Alpha a6300 is a huge value for the money due to its power, performance, and durability.